Matrix Directors in the Running to Helm Justice League Movie? Warner Bros.’ live-action Justice League movie is expected to bring together DC Comics most popular characters: Batman, Superman, Wonder Woman and Green Lantern. Following Ben Affleck’s comments, that Warner Bros. Justice League movie “sounds really exciting” but that he’s not involved in the project, comes word from Moviehole that the studio is eyeing Matrix trilogy directors Andy and Lana Wachowski to helm the highly anticipated superhero team-up. The Wachowski’s just completed Warner’s ensemble sci-fi drama Cloud Atlas and have experience bringing comic books to the big-screen. The two co-wrote and produced the graphic novel adaptation V For Vendetta, and directed, wrote and produced Speed Racer, based on the Japanese anime and manga. The epic superhero team-up Justice League is expected to bring together DC Comics most popular characters: Batman and Superman, as well as Green Lantern, Wonder Woman and The Flash to defeat the world’s greatest threat. 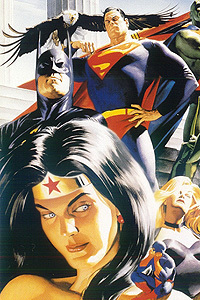 Warner Bros. is expected to release Justice League in theaters around summer 2015, which would put it up against Marvel’s Avengers 2, slated for May 1, 2015.